You can make a difference by becoming a member, volunteering, or by supporting the endowment. Join us for special events, including civil war reenactments and special holiday exhibits. Facilities are available for weddings, birthdays, family reunions, and other special events. The perfect mix of history and nature just waiting to be explored. RENFREW PARK: Free of charge. Open dawn to dusk year-round. Open dawn to dusk year-round and free of charge, Renfrew welcomes you to explore the historic grounds and miles of nature trails. Renfrew Museum is a restored farmstead with many outbuildings to see and activities to participate in. Your tour begins at our Visitors Center with a DVD presentation, and an explanation of the nation’s leading collection of John Bell and Bell family pottery. Paid admission takes you on a guided tour of the 1812 Renfrew Museum where you will see the kitchen, dining room, parlors and bedrooms with period furnishings throughout. Now, two centuries after Daniel Royer’s day, much of the landscape is unchanged. 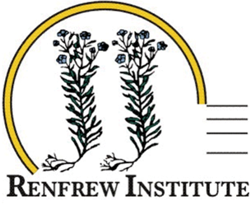 As an historical institution, Renfrew offers its visitors an intimate view of the past. Visit us in Waynesboro, and discover how the agriculture, industry and domestic life of over 200 years ago worked together to make a prosperous Pennsylvania German farmstead. A special feature of the Renfrew Museum is the only permanent public display of artifacts from the Snow Hill Cloister, a 19th century monastical society located in nearby Quincy, Pennsylvania. Located in the Visitor Center is a quaint gift shop with an interesting array of items, many from local artisans. Gift shop hours during season are the same as museum hours. Off-season hours are Monday through Friday 11:00am until 4:00pm.